Published on 06. 08. 2012 in comics and cartooning, culture, current affairs, music and pictorial arts. 1 Comment Tags: Alyssa Rosenberg, Doonesbury, Frederik Høyer-Christensen, graffiti, India, Perry Anderson, Rubadub Sundays, Stengade 30, Tim O'Neill. Look! 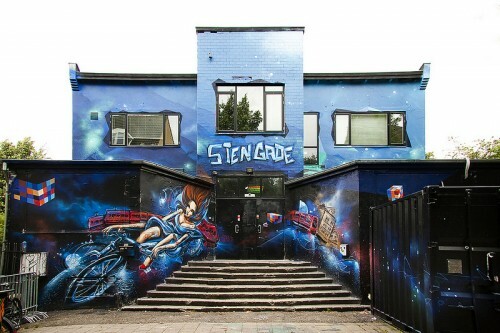 Stengade 30, the by now legendary Copenhagen club, locus of Rubadub Sundays for the past decade, has new facade decoration. Executed by SOFLES, it’s perhaps somewhat tacky, but certainly spectacular, fitting the club well. Imagine it nightlit in a haze. Flix courtesy of Frederik Høyer-Christensen, full set here. Robert Fisk on the destruction of Syrian treasures. Unsurprisingly, but also predictably, the cultural heritage of Syria is being destroyed in the current civil war. Fisk has been reporting on such events since the war in Bosnia, and he does it better than anyone. Alyssa Rosenberg on the recent, symbolic passing of the torch in Doonesbury, otherwise known as still-the-greatest-current comic strip. Rosenberg gets it, Tim O’Neil at The Comics Journal doesn’t (scroll down a bit), although his critique is worth reading, if nothing else because it presents a dissenting, younger-generation view. Perry Anderson on India. Another magisterial historical review from Anderson, this time on India’s constitution and policies of containment and conflict for the past sixty years, particularly as pertains to the North. A great primer.